It’s that time of year again, the time when you catch yourself driving down Assembly Street past Rosewood and the Fairgrounds for no apparent reason, when you click “refresh” on gogamecocks.com so often you break your computer’s mouse, when you spend hours in your co-workers office obsessing about the merits of the “classic all whites” versus the “fire ant reds” uniform combination. That’s right sports fans – its game week! What, you may ask, gets people in the capital city through those cold, boring winters and brutally hot summers when nothing is going on? It’s the knowledge that, for at least 7 weekends each fall, Columbia is a hotbed of pigskin activity as the beloved hometown South Carolina Gamecocks host teams from all over the South. The games are such a big deal that many people with other rooting interests (including yours truly) find themselves going out to the stadium each Saturday and following and pulling for Carolina. Put simply, it is such a large part of the fabric of the Midlands, its just hard not to follow, and root for, these perennial underdogs of the gridiron. With that in mind, Tank and I decided to head out to the picturesque industrial wasteland that is home to Williams Brice Stadium and try out a relative newcomer to the lunch scene: The Loose Cockaboose (“TLC”). TLC has been open for a few years now as a bar, catering to the pre-and-post football game crowd, as well as people looking for an out of the way, relaxed spot in which to get plastered year round. They boast a beach volleyball court and large back patio with a bad stage. Really, you get the impression when you walk in that this is the type of bar for “serious” drinkers. You know the place. The type of locale where passing out on your stool is not frowned upon, but rather expected. While you probably can’t get any grapefruit juice added to your vodka-cran, you would have no trouble getting the barkeep to make you a three-wiseman, bar-code, or other deadly concoction. How then, would TLC fare at providing lunch options to such discerning customers as Tank and myself? We were about to find out. As you all know, I eat salads at lunch at 99.99% of the time. 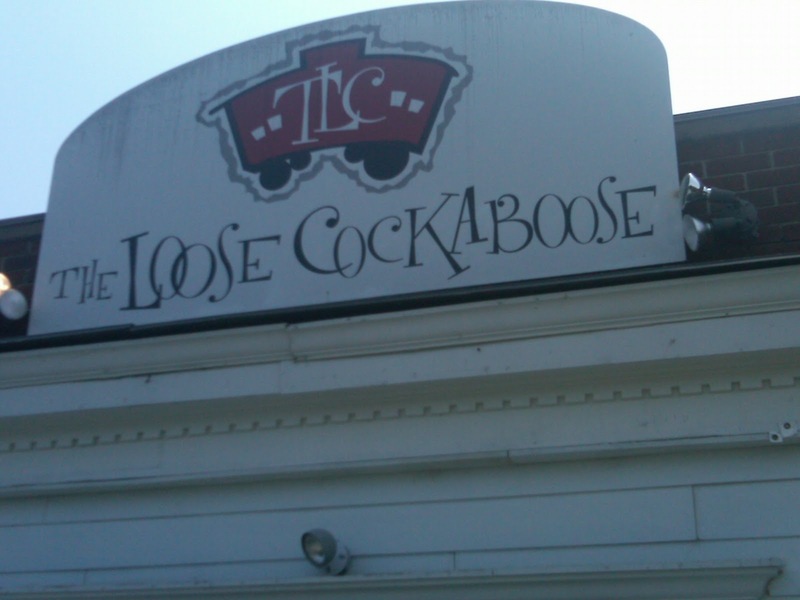 However, if you’ve been to TLC then you know that its not the type of place that would really specialize in salads. 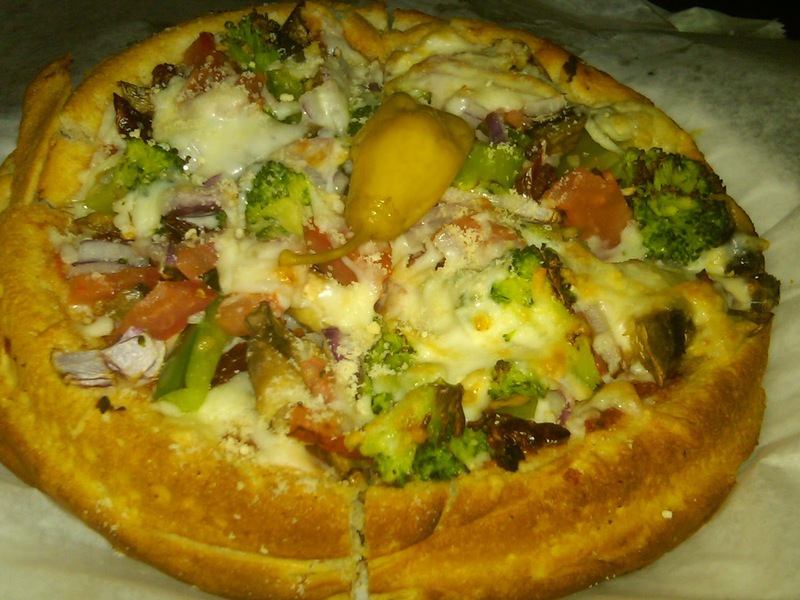 However, I was able to find an alternative that allowed TLC to provide me with ample grease, and still satisfied my infamous craving for herbivorous delights – the Veggie Pizza. I found it on the menu and ordered it immediately, though with some trepidation. When the pie arrived, I knew I had made a solid choice. This thing was literally busting at the seams with vegetable goodness. Toppings included: mushrooms, red onion, broccoli, corn, tomatoes, banana peppers (a lunchmen favorite on pizza), black olives, roasted red peppers, and garlic. Holy s$%t that’s a lot of vegetables, even for this guy. While there was no meat on this entre, the mere size and height of this pizza even impressed Tank. Speaking of Tank, as you would expect, he, determined to make sure that some animal blood was spilled this lunch hour, went for the Philly Cheese Steak, sans mushrooms, along with baked potato salad as a side item. The Sandwich was adequate, if not spectacular, and the side item bore a eerily striking similarity to a certain BBQ joint just around the corner on Shop Road. To TLC’s credit, the menu is replete with items that, even Tank admits, are probably better than the Philly and more appropriate for a review (“Cocky Club,” “Bonanza Burger” featuring fried onions and BBQ Sauce, and the “Fratastic” Pizza, to name a few). However, Tank had one of those moments when our waitress came in which he wasn’t really sure what to get yet, but didn’t want to hold things up, so just blew his load early and ordered the first thing his eye caught. A rookie mistake for sure, but one we are all prone too. We would be remiss if we did not mention that TLC, as a bar, specializes in getting you sauced. They claim to have the coldest beer in town (who doesn’t these days – besides Salty Nut, which seems to pride itself in providing luke-warm draft to its patrons). Based on its looks. Its probably a pretty fun place to watch a game and drink with your buddies. However, its also a solid lunch spot, and if it catches on with the many people who work (and now live) near the stadium, it will be around for many years to come. In any event, I was in Florence during the lunch hour. Faced with a plethora of delicious lunch choices, I invited Papa Frodo to lunch (my treat, since he paid for my college). He immediately suggested Jumpin’ J’s, a Florence landmark, and a place I frequented when I was in high school. This place is quintessential Florence. A former McDonald’s, it consists of bad wallpaper (even though I’m sure the owners think the wallpaper is classy), Waffle House-style tables and chairs that are kept meticulously clean by the staff, and cash register clerks with fake tans, tattoos, and poor grammar. However, if you want to get your grease fix on, I am convinced there is no better place in the Pee Dee, and probably South Carolina. Like any fine greasy spoon restaurant, the menu is extensive, with a variety of offerings. Everything from a Greek salad (light on the lettuce, but heavy on the feta, chicken, and dressing) to a fried popcorn shrimp platter (like any good popcorn shrimp platter, the weight of the popcorn shrimp is more than 75% made up by the fried breading), to a steak sandwich (literally, they grill up a rib eye, cover it with lettuce, tomato, and mayo, and put it between two toasted and buttered buns), to a cheeseburger platter. Papa Frodo went with the steak sandwich, and I went with the cheeseburger platter with onion rings. As a 10+ year long resident of Columbia, I forget how much I miss good onion rings. Those who grew up in Columbia wouldn’t know a good onion ring if it landed on their face and broke wind. The best I have been able to find in Columbia are at the Fat Boy on US 1 heading to Lexington, or Maurice’s Piggy Park. The Fat Boy is quite a bit out of my way, and I don’t too much care for Maurice’s politics, so I try to stay away from his establishments. The rings at Jumpin’ J’s are the way God intended them to be prepared: fresh cut, salted, breaded, salted again, breaded again, and then deep fried. 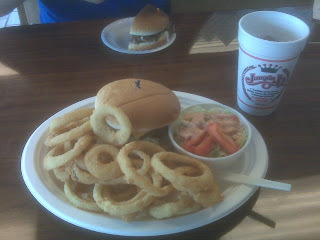 When you bite into a Jumpin’ J’s ring, you actually hear the crunch, taste the warm, salty, fried breading, and then taste the firm onion. The rings truly are taste bliss. I had to take a five minute break to catch my breath after writing about them. The burger also was good, except I found the bun to be a little big. I like the bun on a burger to be there, but only there as an afterthought, but this bun was standing front and center. It wasn’t terrible or anything, namely because it was slathered with butter and toasted, but I would have preferred a smaller (slathered) buttered and toasted bun. In addition to the aforementioned burger and rings, the cheeseburger platter also came with a side salad. Again, if you are not from Florence and have never spent significant time visiting that fair city, let me translate what a side salad is, Florence style. It is three nickel sized shredded pieces of iceberg lettuce, one cucumber slice, and one half of a Roma tomato, covered in eight fluid ounces, or approximately one cup, of Thousand Island dressing. You don’t so much eat the salad as you slurp it. Having grown up on side salads from Jumpin’ J’s, I kid you not when I say that I didn’t know what spinach, arugula, or romaine was until somewhere in my 2nd semester of college at USC. The cheeseburger platter was so big, Papa Frodo just went with the steak sandwich, didn’t order rings or fries of his own, and had some of my rings, and it was a gracious plenty for us both. As good as the food is at Jumpin’ J’s, the best thing they have going for them is their iced tea, and more particularly, their ice. I am pretty sure they get their ice from some Swiss fairy maiden that collects it from the peaks of the Swiss Alps and delivers it, crushed, or more aptly, shaved, each morning. That, or they get it from the Lynches River near Effingham. In any event, think “ice” in terms of Hawaiian shaved ice. 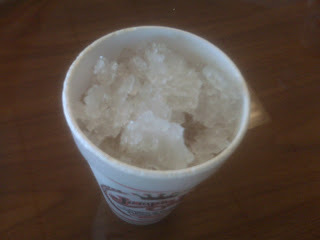 In fact, that is really what you are getting when you order a sweet tea at Jumpin’ J’s, a sweet tea flavored Hawaiian ice. The ice is so finely shaved that it melts in your mouth and just makes you happy to be alive. I have had good ice before (Groucho’s in Columbia, Tanner’s Big Orange in Greenville), but no ice compares with Jumpin’ J’s ice. And the best part of all is that the friendly cash register workers, after they get back from their smoke break, will gladly refill your cup with ice for you to take it with you. The Lunchmen tried to review the McCutchen House during the Spring school semester. However, perhaps foolishly, we waltzed into the place 7 strong without a reservation. After sitting in the entrance waiting for 15 minutes, we bailed and enjoyed Tiyo's instead. 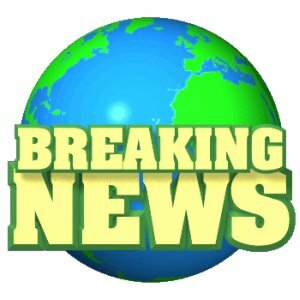 Over the summer, the McCutcheon House has undergone renovations, and the Daily Gamecock has notified those of us eager to get into the revamped venue for lunch that the expensive renovations are complete. With the new kitchen, we can expect a new, broader menu. Excellent news - the Lunchmen will be heading there soon. The Lunchmen like breakfast... a lot. So why don’t they ever eat it? Mostly because they’re already 30 minutes late for work by the time they drag their sorry asses out of bed. Accordingly, breakfast falls in line behind other tasks that only occasionally get accomplished, like putting on a tie and practicing personal hygiene. Aside from the detriment to health and nutrition, skipping breakfast is a terrible idea, because by 10:00, the Lunchmen are hungry enough to eat yogurt out of the "small" of Lisa Lampanelli's back. Hell, we would eat David Hasselhoff’s cheeseburger scraps if they got shoved across the desk at 11:05. We’re no fan of chains, but lets face it, deliciousness conquers all. Chick-fil-a did a great thing when they introduced the chicken biscuit, and damn near changed the world when they rolled out the chicken mini. These ideas both have one thing in common – modifying lunch favorites for breakfast eaters. That’s why the Lunchmen are hereby calling on Chick-fil-a to develop the next big thing: the Spicy Chicken Breakfast Burrito. Come on Truett, you know you like it. EDITORS NOTE 1: Hat tip to Spoony for craving spicy chicken at 9:00 a.m. Your average Columbian would likely agree with us if we claimed that Michelle Wang's "M" restaurants have the overall best Chinese food in town. I say average Columbia, because there are always outliers (like Hot Pockets), who will take issue with any sweeping claim that we might make. However, the best sushi?!? I was a little skeptical that Columbia would agree with this humble blogger that Miyo's/M-Vista/M-Cafe also has the best sushi in town. In reality, I believe it is the sushi rolls that garnered the "M" restaurants nearly 30% of your votes, placing the "M" restaurants #1 in our sushi poll. Notably, for the first time ever, we had a three-way tie at second, between Camon, Saki, and Tsunami, obtaining 10 votes and 18% of the support apiece. I agree that Camon and Saki are right at the top. 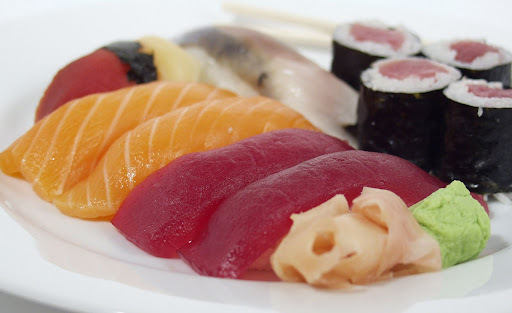 In fact, if I am craving sashimi or nigiri instead of sushi rolls, I prefer Saki over the "M" restaurants. Maybe it is simply psychological, but Saki's sashimi seems the freshest to me. Sakitumi came in a distant third, obtaining only 6 votes; Sushi Yoshi, often heavily criticized by the Lunchmen landed 3 votes, and Fujiya only obtained 1 vote (ouch). Michelle, please keep up the delicious work! As a native Columbian, few words conjure up more disturbing images for me than “Irmo.” I’ll be the first to admit that I have long held a disdain for our suburban neighbors to the northwest, what with their award winning public schools, lack of southern accents, and indoor carousels. In fact, Irmo is perhaps best known for what the Lunchmen hate more than anything – crappy chain restaurants. 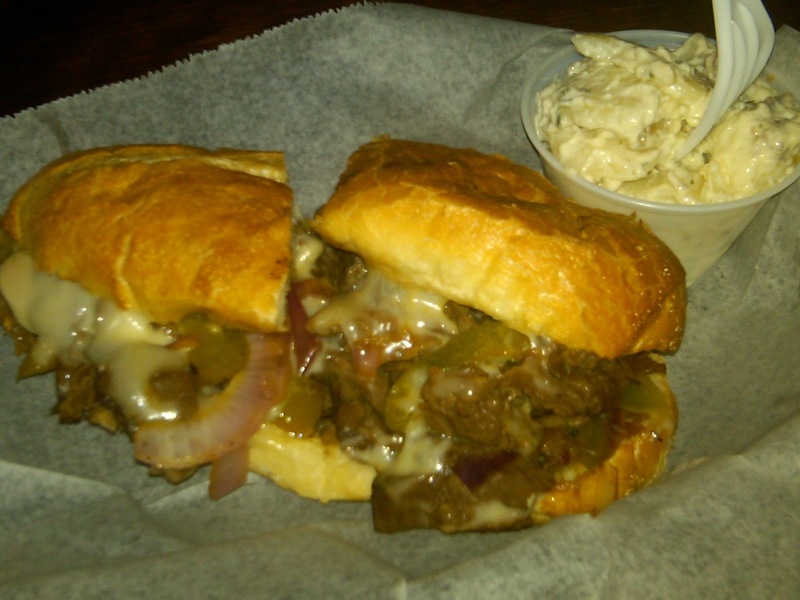 But, there is a needle in every haystack, as they say, and Irmo is the home to a true diamond in the rough: Mathias Sandwich Shop. We had heard that this place was legit, so Tank and I snuck into enemy territory this week incognito-style to scout out the situation. Nestled on St. Andrews Road just south of the intersection with Lake Murray Boulevard, Mathias sits in a non-descript store front along a row of other unspectacular businesses. While not overwhelmed by the outside, Tank and I were vastly impressed with the overflowing parking lot – particularly given the late hour which we chose to dine. It’s always a good sign if a restaurant never seems to have enough parking. Forced to park three businesses away, Tank and I were glad to finally reach the air-conditioned dining area on this typically hot summer day. We walked up to the counter to order and were greeted with rows of desserts ready to be consumed. Tank, in typical Tank fashion, grabbed a carrot cake slice and two forks for an appetizer – the key to any nutritious meal. We both tried the cake and agreed it to be top notch (not as good as Ms. Tank’s, mind you, but serviceable for sure). It was not too dry or heavy on the icing, which are common mistakes with carrot cake. As for the meals, I went with the chef salad (shocking) and found myself enjoying a large bowl of garden goodness along with what seemed like a pound of lunch meats and about ½ dozen chopped boiled eggs. The salad stands up to any other chef in town. Tank, eager to try their signature items, ordered up the Pimento Cheeseburger and made quick work of his selection. While a bit creamy, the pimento cheese was described as solid, and the burger itself drew comparisons to Rush’s - a midlands favorite. Also, to top things off, Tank and I split an egg salad sandwich on white toast with lettuce and tomato. This is one of my favorite sandwiches, so I was going to like it either way. Tank, infinitely more discerning when it comes to such things, also praised the egg salad, particularly the strong amount of pepper. Overall, it was a solid lunch call and definitely worth the trip. While it probably won’t be a regular part of our rotation given its distance from downtown, we definitely recommend it to anyone who lives or works in the area. If you don’t have the good sense to move closer into town, at least eat at this place while you’re stuck living out there. PS – Mathias has some really good tailgating specials for $24.95 that would come in handy in the fast approaching football season. As you all know, the Lunchmen never eschew to a chance to visit our friends across the river, and last week was no different. It was our new clerk The Jolly Green Giant’s first day in the office, so we allowed him the honor of making an inaugural bold lunch call. We were all expecting the typical wing joint/bbq/sports bar request, but were pleasantly surprised when he threw out the idea of heading over the bridge to Café Strudel, anchor of the “Vista West” area of town. Just about all of us had been to Strudel on Sundays for brunch, so we were all eager to give it a shot for a lunch hour destination. No doubt many of our readers are also familiar with the Sunday Brunch here, most likely having tried the “Hangover Hashbrowns” in an effort to soak up the previous night’s mistakes. This, however, was on a Monday, so no one had “tied one on” the night before (except maybe Kali). For those of you who have never been there, Strudel is located in an older two-story building that obviously was not intended to be a restaurant. The rooms are small and crowded with seemingly randomly placed tables. We had a group of nine, and did not hold out any hope of being able to sit together. I think we ended up with a table of four, three, and two. However, the place is so small you are basically sitting at the same table with anyone on your floor. Lunch is busy at the Strudel, and diners would be wise to order their food along with their drinks and save their harried waitress a second trip to your table. The management seems to realize how busy the staff is, as they provide the largest glasses in town for your beverages, ostensibly to cut down on the need for refills. Unfortunately for them, I drink un-sweet tea like Lindsey Lohan drinks rum punch, so even with the large glasses I still had about four helpings before the food was out. Speaking of the food, this place really does make an effort to do everything well. They feature daily specials, some of which have become quite popular – such as the chilled peaches and cream soup and the BBQ Turkey Melt on and English Muffin. While a little on the artsy side in terms of atmosphere and clientele, the menu designers do not shy away heartier fare such as hotdogs, a taco burgers, and the aforementioned hashbrowns. Members of our group also tried the famous Martino Sandwich, a couple of salads, and the California Wrap. As I mentioned, our party size forced us to split into 3 tables. Now, when this happens, many diners will try to choose a table based on location, comfort, and conversation potential. Not this guy. When we have to split up, I ALWAYS try to sit with Tank. Why? Simple, really: his proclivity to order and share items off the dessert menu. This outing offers a classic example. When we ordered our drinks, Tank asked for a piece of carrot cake and three forks “as an appetizer.” Soon thereafter our waitress brought in what appeared to be about 5/8 of an actual cake. It was bigger than Captain Understatement’s ego after a successful tennis match. My table, ever thankful for Tank’s boldness when it comes to sweets, dug in vigorously, happily spoiling our appetite in favor of this monstrosity of a dessert. Unfortunately, the food that was to be our actual meal was admittedly underwhelming after we finished the carrot cake. It would be sort of like if KISS had to open for another band instead of headlining. How could the main act hope to follow such a performance? It, like our entrees, would be destined to pale in comparison. That’s not to say they can’t stand on their own, but no one should have to follow the Gene Simmons-esque awesomeness of a multi-pound slab of carrot cake appetizer. Next time we’ll know better and hold off on the cake until after the meal – or at least just make the cake the meal itself.